The 1945 Stanley Cup Final was a best-of-seven series between the Detroit Red Wings and the Toronto Maple Leafs. The Maple Leafs would win the series 4–3. For the first time, two rookie goalies met in a Stanley Cup last round. 18-year-old Harry Lumley was in net for the Wings and the Leafs had 26-year-old Frank McCool replacing Turk Broda, who was doing army service. McCool, whose surname belied his jumpy demeanor, had been discharged from the army himself with stomach ulcers, but despite his medical condition, he would win the Calder Trophy. And he didn't allow second-place Detroit, who'd gone 8–1–1 against third-place Toronto that season, a goal until just past the two-minute mark of the fourth game. His three-in-a-row zeroes were a postseason record that would not be repeated for 58 years, and the Leafs sat on the brink of a four-game outbroom. They almost did — despite a hat trick by 19-year-old Leaf face-off man Ted Kennedy, Detroit won game four. In a bizarre near-reversal of 1942, the Wings also won the next two games, both on Lumley shutouts, to force a Game seven at the Detroit Olympia. Toronto hadn't been able to take the Cup at Maple Leaf Gardens. The Maple Leafs won the Cup in game seven against the Red Wings by a final score of 2–1, but after the game, the Detroit crowd chanted, "We want Lumley!" and the dejected goalie was brought back to the ice from the dressing room while Toronto celebrated. Lumley would go on to a Hockey Hall of Fame career and McCool would play just 22 more games in the NHL, as January 1946 brought Broda back. This was the first time in the history of game seven of the NHL Stanley Cup Finals that the home team did not win. The home team didn't lose a game seven final again until Montreal beat Chicago in the 1971 Stanley Cup final. This did not happen again until Pittsburgh beat Detroit in the 2009 Stanley Cup. Hap Day almost had to eat his words of a few years back when he said of the Leafs' 1942 comeback from being down 3–1 in games "There will never be another experience like this." But Babe Pratt scored the winning goal in a 2–1 victory that saved the Maple Leafs from being victim of a great comeback win by the Red Wings. The Montreal Canadiens finished first for a second straight season. The Toronto Maple Leafs encountered difficulty finding a goaltender for the 1944-45 season, but plucked Frank McCool from Calgary to fill the void. McCool played well, helping the Leafs finish in third, and won the Calder Trophy as the league's best rookie. But Toronto surprised the Canadiens, beating them four games to two. In the semi finals, and second place Detroit won their best of seven series against the Boston Bruins, four games to three. In the Cup final, McCool shut out the Red Wings in the first three games. But with their backs against the wall, Detroit fought back to even the series at three games apiece. Detroit's goaltender, Harry Lumley, earned two shutouts of his own. In the seventh and deciding game, the Maple Leafs beat Detroit 2-1 to win the Stanley Cup. 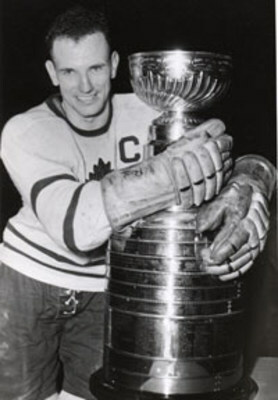 The Leafs' Babe Pratt scored the winning goal. 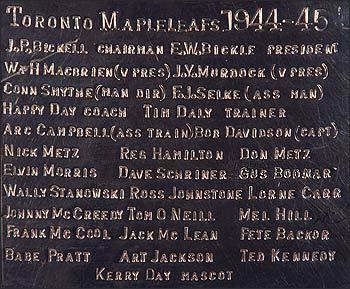 The 1944–45 Toronto Maple Leafs season was the club's twenty-eighth season in the NHL. Toronto had a mediocre 1943–44 season, finishing the year with a 23–23–4 record, earning 50 points, and a third place finish in the NHL standings. The Leafs were then quickly eliminated by their arch rivals, the Montreal Canadiens, in the first round of the playoffs. Toronto was a very streaky club during the regular season, where they started off very hot, winning their first six games, and 10 of their first 14, before a mid-season slump, when they managed a 5–10–2 record in 17 games. The Leafs would continue to be a streaky club for the remainder of the year, which included a five game winning streak, and a seven game winless streak. Overall, the Maple Leafs managed to end the season with a 24–22–4 record, earning 52 points, and third place in the NHL standings. The Leafs offense was led teenage superstar Ted Kennedy, who turned 19 during the season, and had a club high 29 goals and 54 points. Gus Bodnar, who was also 19 years old, led the club with 36 assists, while Lorne Carr put together another solid season, scoring 21 goals and adding 25 assists for 46 points. Sweeney Schriner, who only appeared in 26 games, managed to score 22 goals and 37 points. Babe Pratt led the Leafs defense, scoring 18 goals and 41 points, while fellow blueliner Reg Hamilton had 15 points, and a team high 41 penalty minutes. In goal, rookie Frank McCool had all the action, winning 24 games and posting a 3.22 GAA, while earning 4 shutouts. McCool would win the Calder Trophy for his efforts. The Maple Leafs would open the playoffs against the heavily favoured and defending Stanley Cup champions, the Montreal Canadiens in a best of 7 series. The Canadiens dominated the league, as they had a record of 38–8–4, recording 80 points, which was 28 more than the Leafs. Toronto stunned the Canadiens in the series opener at the Montreal Forum, as Frank McCool shut out the Habs in a 1–0 Leafs victory. The Leafs then went up 2–0 in the series, winning a close game by a 3–2 score. The series shifted to Maple Leaf Gardens, however, the Canadiens roared back, easily defeating Toronto 4–1 to cut the Leafs series lead to 2–1. The fourth game was decided in overtime, and it was the Leafs who were victorious, winning 4–3, and taking a commanding 3–1 series lead. The series moved back to Montreal for the fifth game, and the Canadiens easily dismantled the Leafs, winning 10–3, and sending the series back to Toronto for the sixth game. The Maple Leafs would complete the upset, hanging on for a 4–3 win in the game, and win the series 4–2. Toronto's opponent in the 1945 Stanley Cup Finals was the Detroit Red Wings, who finished the regular season with a 31–14–5 record, earning 67 points, which was 15 higher than the Leafs. The Red Wings had defeated the Boston Bruins in seven games in the first round. Toronto, led by Frank McCool, would shutout the Red Wings in the first two games held at the Detroit Olympia for an early series lead. The Maple Leafs returned home for the third game, and took a 3–0 series lead as McCool would earn another shutout as Toronto won the game 1–0. The Red Wings managed to finally find the back of the net in the fourth game, winning 5–3 to avoid the sweep. Detroit goaltender Harry Lumley then shutout the Leafs in the fifth game by a score of 2–0, and he would once again earn a shutout in the sixth game, as Detroit won the game 1–0 in overtime to set up a seventh and deciding game. Toronto, led by goaltender Frank McCool and Babe Pratt, who scored the series winning goal, managed to hang on for a 2–1 victory in the seventh game to win the Stanley Cup for the fifth time in club history, and their first title in three years. The year is 1945. 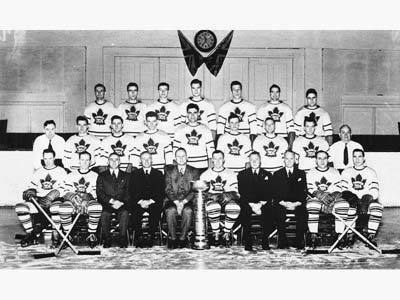 Despite a thinned roster due to World War II enrollments, the Toronto Maple Leafs win the Stanley Cup. Barely. Flashback to 1942. The Detroit Red Wings have a 3 games to 0 lead on the Leafs. Somehow, the Leafs scratch and claw their way back, winning an unthinkable 4 consecutive games in the Stanley Cup finals to win the Stanley Cup 4 games to 3. In 1945, the exact same scenario, with roles reversed, almost happened. This time it was the Toronto Maple Leafs that got out to a 3-0 lead to open the finals, never surrendering even a single goal. War time goalie Ulcers McCool shuts the door with 3 of his 5 playoff shutouts that season!